My company, Storythings, was lucky enough to work with the brilliant Fiona Romeo, Director of Digital Content & Strategy at MOMA, last year. Fiona worked with me briefly at the BBC in the early 2000s, when I ran an innovation department called Creative R&D. At that time, only a minority of the UK public was online, so we commissioned a couple of ‘scenario planning‘ exercises to imagine how internet use was going to change life in the UK. One of these was focused on how children might use technology, the risks this might create, and the roles that schools, parents, and other organisations would play in managing these risks. When we met again last year, Fiona reminded me that the project was from 2004, and so we were predicting how children’s online lives might be in 2014. The project developed three scenarios – ‘Watching You, Watching Me‘, in which there was a common shared ‘safe’ online space, and an open unregulated space; ‘Paying to Play on the Multinet’, in which we imagined a number of regulated spaces managed by corporations, and similar unregulated open space; and ‘Left to their Own Devices‘, in which there were only open interconnected networks, and regulation was a shared responsibility between users and service providers. It’s worth pointing out that the aim of scenario planning is absolutely *not* about predicting the future. Instead, they are strategic exercises to model how different trends and drivers *might* shape the future, so that you can develop more effective strategies, and ways of tracking change. The overall concept of a mixed internet between commercial regulated spaces and the ‘open’ internet was a pretty good prediction of how the last 10 years of the internet has played out. The ‘Multinet’ scenario in particular looks a lot like the world of the ‘Stacks’ that Bruce Sterling talked about a couple of years ago at SXSW. Mobile is a big feature of all three scenarios. This was prescient, with the iPhone still a couple of years away. But SMS had been around for over 5 years, so we knew that mobile devices were already really important to teens. In all three scenarios, a big feature is how kids would work around limitations to get the connectivity and content they wanted. No surprises there, as teens have always done this, but it’s a really important part of designing any service aimed at kids and teens.. The scenarios were presented as a gorgeous poster by Xplane, and I’ve uploaded them here if you want to download them and take a look. It’s fascinating to look through the scenarios, and it’s sparked my interest in doing work like this again. If you’re a company or organisation who would be interested in doing some scenario work, then do please get in touch. Feb 21st 2014 is the fifth The Story conference, an event I started as a side project to my (then) day job at UK Broadcaster Channel 4. Five years feels like a good time to look back, so here’s five things I think I’ve learnt in the last 5 years. When I started The Story, I had a (very) full time job, working as a commissioning editor at a major UK broadcaster. I commuted over 3 hours every day, and had two daughters aged 3 and 5. A side project was the last thing I needed, but five years later, I don’t work at Channel 4 anymore, and now run a company that started out of the ideas and connections from The Story, and works with clients like Google Creative Labs, Penguin, Dazed & Confused, and the BBC. It helped that I have an awesome wife who also works in the creative industries, and we have a long history of supporting each others’ creative projects. But it’s made me realise how important it is to nurture and develop side projects, even if you’re not really sure what they will turn into. Side projects tend to be the things closest to what we *really* want to be doing at any moment, even if it doesn’t seem obvious at the time. A side project will at least bring valuable knowledge, perspective and insight into your day job, and at best will be a ready life-raft if you need to bale out of your current job and start anew. If you don’t have at least one side project outside your day job, start one now. The Story started out, like most side projects, as lots of conversations. I was going to lots of different conferences focusing on things like TV, Games, Film, Web and Art, and I was getting frustrated that there wasn’t an event that looked at the overlaps between the different industries, and didn’t focus on business or technology. Jeremy Ettinghausen and I had been asked to talk at Picnic in 2009 about storytelling, and we talked about doing a conference based on that talk, and then a conversation with Emily Bell at the Edinburgh TV Festival tipped me over into actually doing it. I then leaned very heavily on Russell Davies‘ experience from running Interesting at Conway Hall. I had about 3,000 followers on Twitter when I started The Story, and did a back-of-the-envelope calculation that it would be enough of a network to sell about 400 tickets to an event that I was paying for myself, without any funding or investment at all. It’s sold out every year since. I’m not sure I’d have been able to run The Story without Twitter – I’d have needed to spend more time getting mainstream press, and that would have been impossible with a day job or a part-time team. The Story really is the product of a network, not one person. This point is entirely borrowed from Dan Catt, and explained perfectly in his great blog post from 2011, about a project which he recently restarted two years later. The point he makes is an excellent one – most people give up on doing something new after one or two tries, but normally, six iterations of making something is enough to get you 90% of the way to understanding what it is, and how you want to make it. So keep trying. I’ve only done five The Stories, but I definitely recognise his point – the first one was a bit of a stumble, the second one was a further experiment to see if the idea had legs, and since then I’ve discovered more and more about what the event is, and more importantly, what it isn’t. I get brilliant feedback from attendees and friends every year, and although it’s by no means a slick, professional event, I learn loads from every event. So each year is another opportunity to test out ideas (like printing the schedule on custom-engraved chocolate bars) and seeing what works. Iteration really is the only secret to making good things. Do something you love, and then do it again. We keep tickets for The Story as cheap as we can – normally around £60-80 (+VAT). Initially, this was down to nervousness – I wasn’t sure if it was going to be any good, and I thought paying £60 for a day conference would help people be a bit more forgiving of a few rough edges. But over the years, it’s become more and more important to the atmosphere and culture of the event. A lot of people tell me that they buy their own tickets, rather than getting their company to pay for it, and some even take a day off work to attend. It is something they do for themselves – a day to sit back and listen to lots of inspiring speakers and get creatively charged up for the year ahead – rather than an industry event that you’re going to have to give a presentation about to justify it to your boss later. This makes a huge difference to the atmosphere in the room. Because people really want to be there, rather than feeling they have to be there, it’s a warm, friendly crowd. They can be critical, but rarely snarky. I’ve been to plenty of industry conferences where you kind of resent having to go, and you spend your time summoning up the nerves to have the conversation with someone else from your industry that you know you probably should do, and then you spend the coffee break pretending to be absorbed in important things on your iphone. There’s a lot of pressure on attendees at big industry events, and this creates a nervousness that often puts the whole event on edge, and can really stop speakers from opening up. If the event costs hundreds or even thousands of pounds to attend, it sets up a huge expectation of value for attendees, and that expectation might be very different from what you want to do with your event. It means your event probably has to focus on one industry, and get in the speakers that everyone expects to hear from this year, so conferences start to look very similar to each other. And a lot of the attendees spend the event snarking on Twitter – I’ve done it myself many times. The Story really isn’t a corporate event – I’d much rather people paid for their own tickets, and turned up as themselves, not what is printed on their business card. Keeping the price low seems to be the easiest way to do this. This point is linked to the one above. The Story has sold out every year, and I’ve had a lot of conversations with people about where we can go with it next. Could we do two days instead of one? Move to a bigger venue? Do a version in New York, or Berlin? Should we bring in some sponsors so we can make the event more professional? It was only when I was curating last year’s event that I realised that all the conversations were essentially the same question – How can The Story get bigger? It’s obvious, isn’t it? If you’re selling out every year, you’ve got to get bigger so you can sell more tickets and be more successful? But I realised that I wasn’t really interested in that at all. I felt moving to two days, or twin tracks of events, would have ruined the magical atmosphere of concentration that can happen in The Conway Hall when 450 people spend a day just listening together. I don’t think I could do The Story in another country without living there long enough to understand its culture in the way I do with the UK. I’ve talked to a few sponsors, but I don’t really need the money to run the event, and the payoff in terms of branding and ‘ownership’ of something I love deeply felt like too much to give away. It seems to be a common problem with independent conferences in their early years. I’ve had similar conversations with Charles Melcher about his excellent Future Of Storytelling event, and there’s been a fascinating conversation about how the awesome-looking XOXO event can cope with scale. I’m a huge admirer of how Greg and the team at Playful have subtly changed the event every year, and similarly with Clearleft and DConstruct. So – I realised there is another solution. Instead of getting bigger, you can get deeper, and weirder. You can try and make the event even more diverse, even less easy to summarise, or to pigeonhole. You can invite people to discuss really complex issues, or to talk about their career and the decades of work and knowledge they’ve produced. You can bring together people, audiences, industries and ideas that might not seem like common bedfellows, but suddenly make sense when they’re put next to each other in a line up of speakers. We talk a lot about diversity, or lack of it, in the tech/media industries, and I think this is related to scale. If you’re constantly trying to make things bigger, you’ll inevitably drift towards homogeneity. If you stay small, you can stay weird. One of my favourite things about curating The Story is the blog posts that appear from attendees afterwards. I never have a conscious theme for the event, but people start making incredible connections between the speakers in a way that makes perfect sense. I wish I was clever enough to discern these themes in advance, but it seems better to trust your instincts and throw stuff together that seems interesting to you, and then just sit back and help the speakers be as awesome as you know they will be. But more than anything else, the most important thing I’ve got from The Story has been the stories it has produced. The awesome speakers, the fantastic feedback from people who have attended, and the conversations and opportunities the event has created. At the end of every event, I always say that it’s an incredibly selfish event, and it is – I started it because I really wanted to go to an event like this, and nobody else was doing it. For the last four years, at least 450 other people have agreed with me, so thank you to everyone who has come along, and I look forward to seeing you at The Conway Hall in Feb. This is the text version of a talk written for BBC Radio 4’s Four Thought programme, first broadcast on October 23rd, 2013. It was recorded at Somerset House in front of a live audience with David Baddiel hosting. Huge thanks to Giles Edwards for the invitation to speak, and for help and advice. Thanks also to Bill Wasik’s excellent And Then There’s This for the account of Jonah Peretti’s work. Thank you for inviting me to come and talk today, and in particular, I want to thank you all for your attention. Your attention is a very valuable thing, and to decide to spend it listening to this talk here today, or at home on the radio, or later online, is not an insignificant act. I’ve worked in digital media and broadcast for over 15 years, and I’ve become obsessed with attention. My story tonight will be about this obsession, and what I’ve learnt about the way attention defines our culture. Because how we understand audience attention – how we ask for it, measure it, and build business empires by selling access to it – is fundamental to our culture. For the last few hundred years, the business of culture has essentially been the business of measuring audiences’ attention. We can trace a line of entrepreneurs of attention from today’s culture backwards through the last two centuries – from Jonah Peretti, who has used his intimate knowledge of the patterns of digital attention to build The Huffington Post and Buzzfeed, two of the biggest news and culture sites on the web; through Arthur Nielsen, who invented the ratings technology that the US TV giants ABC, NBC and CBS were built on; to Charles Morton, who took the raucous entertainment of supper-clubs and taverns and developed the more mainstream and wildly popular Music Halls of Victorian England, from which came the talent that would dominate the early years of cinema and radio. These entrepreneurs were not leaders, but listeners – their particularly skill was in realising that audiences were consuming culture in new ways, finding new ways to measure these new patterns, and new ways to make money out of them. The story of these ‘empires of attention’ is the story of how we – the audience – have engaged with culture, and how the interaction between artists and audiences has moved from visceral participation to abstract measurement and back again. This story starts amidst the raucous popular culture of Victorian England. Back in the 18th and 19th century, public entertainment was found in pleasure gardens, inns and taverns, with acts brought in to perform as the audience worked their way through dinners and rounds of drinks. ‘Song and Supper Rooms’ such as the Coal Hole, in The Strand, The Cyder Cellars in Maiden Lane or Paddy Green’s of Covent Garden offered food and drink till the small hours of the morning. London Gentlemen would go there to find foaming tankards of stout, a dinner and a cigar, all set to the warbling strains of the comic or sentimental vocalists attached to each establishment. The proprietor would act as ‘chairman’, leading the entertainment and calling on regulars to perform their favourite songs and comedy acts. One regular act was the ‘judge and jury’ show, a thinly-veiled skit in the form of mock-trials of society scandals, with the audience and performers acting as barristers, jury and witnesses – in many ways the fore-runner of TV satire like That Was The Week That Was or Spitting Image. The entertainment in these venues was a collaboration between the audience and the acts, with the line between the two often blurred by bonhomie and alcohol. The audience was noisy, and the acts used this noise as a feedback loop – a connection between performers and audience that created culture through call and response. But this connection would start to fray as the 19th century went on. First the Theatre Regulation Act of 1843 relaxed the rules on theatre ownership, but on the condition that no eating, drinking or smoking could happen during a performance. The law was vague and poorly enforced, but it led to entrepreneurs like Charles Morton starting a new kind of entertainment venue, one that appealed not only to the male-dominated taverns and supper clubs, but women and families too. “We make our way leisurely along the floor of the building, which is really a very handsome hall, well lighted, and capable of holding fifteen hundred persons; the balcony extends round the room in the form of a horseshoe. At the opposite end to which we enter is the platform, on which is placed a grand piano and a harmonium, on which the performers play in the intervals when the professional singers have left the stage. By the late 19th Century, Music Hall was the dominate form of popular culture, and the audience experience had moved from the rowdy tavern to the theatre experience we would recognise now. The evening’s entertainment shifted with changes in popular taste, with opera and classical music giving way to variety and comic acts. The acts became increasingly professional – the comic George Laybourne was hired by Charles Morton for the princely sum of £20 per year – and they started to become well-known names, drawing a crowd on their own terms. But although these developments allowed the music hall entrepreneurs to build hugely valuable empires, they also sowed the seeds for Music Hall’s downfall. At the beginning of the 20th century, cinema arrived with an even more spectacular form of entertainment than music hall, perfectly suited to the increasingly dark and quiet auditoriums. The transition took decades, with early films appeared as ‘acts’ within music hall itself, sharing the same comedians and singers popular at the time. But over time the longer feature film format became an evening’s entertainment by itself, and the music hall circuits and entrepreneurs – the ‘empires of attention’ of the 19th century – gave way to the new empires of cinema, and, by the mid-20th century, broadcasting. This was a turbulent time for popular culture, with traditional business models struggling, and new technologies rapidly innovating formats and distribution models as audiences moved their attention to these new forms of culture. That might, perhaps, sound familiar to anyone here working in the media industry. Throughout this transition, the one constant was the gradual breaking apart of the relationship between the audience and the artist. In 1850 popular entertainment happened in rowdy and participatory taverns and supper clubs. By 1950, the audience sat quietly in cinemas or at home, hearing and seeing entertainment that was recorded in a different time or space altogether. The feedback loop – the call and response of the music hall – had disappeared almost completely. The rise of broadcasting brought new problems with understanding audience’s attention. Advertisers had no way of knowing how many people would actually hear their commercials, so without finding a way to measure attention, early radio broadcasters would struggle to compete for ad income with print and other forms of media. In the early years of radio many techniques were used to measure audience attention, from sampled surveys and interviews to ‘radio diaries’ that asked listeners to record their own listening habits. For a brief period, fan mail was used as a way of indicating audience size and interest, often linked directly to the product sponsoring the show. For example, Kate Smith was an early radio star with shows like ‘Kate Smith Sings’ and ‘The Kate Smith Matinee’ on CBS and NBC. Her show ‘Kate Smith and her Swanee Music’ was sponsored by La Palina Cigars, who ran a competition for listeners to send in cigar bands in return for a signed photograph. Over 50,000 cigar bands were submitted in response, demonstrating to La Palina the power of radio as an advertising medium. But competitions like these were unpredictable and too reliant on the individual appeal of stars like Smith. Radio broadcasters understood that they needed to agree on a consistent measure of attention to convince advertisers to invest in radio, so they worked together to define a single measure across their industry. This wasn’t just happening in radio- the period from the 1940s to the turn of the 21st century is known by academics studying the ratings industry as the era of one big number as the competition for advertising money between newspapers, magazines, radio, TV and outdoor media forced competitors in each sector to agree on how to measure their audiences. The result in every case was a single measure – the one big number that was used to represent the behaviour of millions of people. Central to the developments of these measures was Arthur C Nielsen, who took his expertise in market research in the 1920s and 30s and developed new techniques to measure radio audiences in the 1940s. Nielsen ratings then became the main measurement of US TV from the 1950s, based around ‘Nielsen Sweeps Week’ – the periods during the year when Nielsen sampled the television audience, initially by sending out paper diaries for viewers to record their viewing, then later introducing boxes in selected viewers’ home that automatically measured the programmes they watched. This data would be used to set local and national advertising rates, so broadcasters would fight for audience attention with cliff-hangers, ‘stunt-casting’ ( for example, bringing in a hollywood celebrity to guest on an episode) and special editions of popular shows, as in 1997, when the hit show ER broadcast an episode that was filmed and broadcast entirely live. In fact, the popular phrase for the moment when these desperate tactics mark a show’s decline is ‘jumping the shark’, based on a Happy Days special produced for Nielsen Sweeps Week in 1977 when, in a desperate bid for attention, the show writers wrote an episode where The Fonz jumped over a shark-pen on water-skis. Most of the multi-billion dollar ad spend around the world today is bought and sold based on ideas of audience measurement that can be traced back to Arthur Nielsen and his early work in the fledgling radio industry. There is probably no single person who has been more influential in the creation of the global media industries – the ‘empires of attention’ – of the 20th century, yet he is nowhere near as well known as the writers, directors, performers and executives of the media empires built on his work. But for artists and performers, these numbers were a thin and ineffectual connection to the audience. The rich engagement with the audience in live performance had now become a series of numbers on a report. During the late twentieth century – the ‘golden era’ of broadcasting – creators would sometimes not even see these audience reports, and would have to find other ways to get feedback. In a documentary about the making of Blackadder, Director Richard Curtis said that in the early 80s, he never saw the ratings for Blackadder early series, and still to this day does not know how many people watched. He said he used to walk the streets of Shepherd’s Bush during the broadcast, looking in people’s windows to see if they were watching, and if so, whether they were laughing, as it was the only way he could know the audience’s response. It’s a wonderful anecdote, but also a telling illustration of how far the gap between audiences and artists had grown in the 20th century – from the communal rowdiness of the supper clubs and taverns to the silent and invisible audiences of the broadcast era. By the time I started working for the BBC in 2001, multiple generations of TV executives and creatives had only ever understood audiences as numbers. Ratings had become an obsession, but real connection with audiences was rare. I remember being at one of Greg Dyke’s awaydays for senior BBC management during his time as Director General, where senior executives were asked for their opinions about the lives and tastes of sample members of the BBC audience. At the end of the session, there was a theatrical reveal as the real people we were discussing were brought into the room, invited to sit on our tables and talk to the BBC executives about the kind of programmes they watched. I remember the extraordinary sense of surprise and novelty amongst executives that we were meeting actual members of the public, and I felt a bit sorry for the people brought into the room as if they were some kind of exhibit. It made me realise how far TV industry executives were removed from the audience who enjoyed their content – they obsessed over abstract representations of audiences, but were almost speechless when they were brought into the same room. This made me curious about how we’d ended up like this, how audiences and artists had ended up so far apart. I started researching the history of how we measure attention, and how this affects the way that we make and experience culture. I discovered that the last 50 years or so have been an unusually quiet and stable period – the dominate forms of culture, the business models behind them, and most importantly the way we measured audiences’ attention, hadn’t change that much at all. If you grew up in this period, you experienced mainstream culture as a passive member of an audience, either sitting at home watching TV, or in a darkened cinema, with the exceptions being live music or comedy, which were mainly aimed at younger audiences. I remember seeing a chart at the BBC showing how the volume of TV watching changes as we age. The curve starts with a few hours a day as children, then drops sharply in our late teens and twenties as we go out to parties, gigs and pubs to get drunk and find mates. After we settle down as couples and families in our twenties and thirties, TV viewing goes up again – the most voracious TV viewers in the UK are not the advertisers‘ main targets of 16-34 yr olds, but the middle aged and retired. A friend who works in digital media once asked a senior UK TV executive whether he was worried by younger audiences spending most of their time on social media and gaming consoles instead of TV. “Don’t worry”, the executive replied, “they’ll get older and more tired and then they’ll want to just flop out on the sofa and watch TV”. Perhaps these younger audiences will return to TV as they get older, but with a new and very important twist. For the last 10 years has seen the return of the noisy crowd. The invisible voices of the audience are now being heard again over twitter, facebook and other social networks. When I moved from the BBC to Channel 4 in 2007, Twitter had only just launched and ratings were the only measure commissioners cared about. By 2011, when I left, nearly every commissioner knew how to search for the number of tweets alongside their shows, and the most followed people on Twitter were the actors, Presenters and Performers execs were commissioning to make TV. The feedback loop between audience and artists had, in a very new and odd way, been reconnected. The new entrepreneurs of attention in the 21st century understand this new connection- they understand that culture spreads not by distribution – as with cinema and broadcast – but by circulation – sharing between friends over digital networks. One of the most influential cultural entrepreneurs of the early 21st century has been Jonah Peretti, the co-founder of the Huffington Post and Buzzfeed. Peretti’s understanding of how digital culture spreads started in 2001, when Nike launched a ground-breaking online campaign that let people stitch personalised messages onto their trainers. Peretti, at the time a student at MIT in Boston, chose the word ‘sweatshop’, and when Nike refused his order, he started an email exchange to find out why. He sent this story to a few friends, and they in turn circulated it to more people, sharing it on email lists, websites and forums. Within a few days it had been read by millions of people and Peretti was on the TODAY show on NBC, talking about both the story and the interesting new way it had spread across the internet. The Nike experience made Peretti curious about how stories spread through digital circulation, so he went around MIT asking for help to understand how it worked. The first factor was the science of networks and the number of nodes – or people in this case – you need for stories to become ‘contagious’ and spread widely. The second factor was cognitive science – why do we decide to share stories with each other? What kind of emotions – laughter, shock, outrage – drive us to circulate stories around our friends, and what are we saying about ourselves and our communities when we share stories? That last line is a stark illustration of how the empires of attention are shifting as we move from an era of distribution to an era of circulation. Peretti’s memo lists a series of traditional media business models that BuzzFeed will not be following, and then closes by emphasising that they aren’t lucrative opportunities but are actually distractions from his core goal – inventing a new kind of media empire for the 21st century. Peretti is a building a new Empire of Attention – one that synthesises the call and response of 19th century music hall and the incredible scale of 20th century broadcast distribution. The combination is a potent one – the sheer visceral impact of thousands or millions of people sharing and discussing your stories is a new experience for anyone used to traditional broadcast media, and we’re having to learn how to tell stories in an age of digital attention. We’re already hearing TV commissioners complaining that knee-jerk responses from audiences on Twitter are killing new TV shows before they have a chance to build an following. We are no longer a passive audience, but the judge and jury of what will survive and be recommissioned, deciding the fate of culture by how we spend our attention. This new feedback loop can be incredibly empowering, but it is also destructive – the anonymity of social media can encourage trolling and other kinds of abuse. Crowds amplify the good and the bad in human behaviour, and the internet amplifies this even further. But I don’t think it’s possible to have one without the other – the noise is also the signal, and we will have to develop new ways to tell stories that take this into account. The culture of the 21st century will be defined by how we synthesise these contradictions – scale and intimacy, spectacle and conversation, signal and noise. We have seen the relationship between audiences and artists move from intimacy to distance, and now back to a strange kind of intimate distance. What will culture look like in an age of digital attention, and what new empires will emerge around it? How we will we measure attention, and how will this change the relationship between artist and audience? Who will be the Charles Morton, the Arthur C Nielsen, or the Jonah Peretti of the next 50 years? So, to finish, thank you again for your attention. Thank you to those of you here in the room, for your attention is the feedback loop that made it possible to tell my story. For those of you listening at home or online, we can now use the feedback loop of social media – I’m @matlock or @storythings on twitter. Thank you again for your attention, and I look forward to giving you some of my attention in return. This could be a slightly obvious and pedantic post, but something keeps niggling at me when I read reports about changing audience behaviours around broadcast media. A lot of reports are using the word ‘TV” very loosely – sometimes to refer to specific broadcast models, sometimes to refer to all video watching in general. We’re seeing big changes in the way audiences find and consume video, and this sloppy use of the word ‘TV’ isn’t helping us see how the industry is changing. So I wanted to write up some notes on what we mean when we use the word ‘TV’, and how we need to be more specific in our language from now on. The recent Telescope report on TV Viewing in the UK reports that we own fewer TV sets than 10 years ago (1.83 per household, down from 2.3 in 2003), yet we’re watching over four hours of ‘TV’ per day, up from 3 hours and 36 minutes in 2003. This is a really interesting report, looking in detail at changing behaviours in media consumption, and with a very innovative ‘TeleHappiness’ report that shows what kinds of content makes us happy in different parts of the UK (sport in Wales, comedy pretty much everywhere). But the news coverage of the report uses the word ‘TV’ to describe three different things, a mistake made by many people analysing the current media market, not least in similar reports about the the TV ad industry body Thinkbox’s recent report on on-demand viewing. For most of the last 50 years, the phrase ‘TV’ was a useful catch-all phrase covering three things – the business model of broadcast TV, the content commissioned by TV broadcasters, and the box in the corner we used to watch broadcast TV. Over the last 10 years, those three things have started to split from each other, and the split is getting more pronounced every year. The risk is that research or analysis of audience behaviour that doesn’t take account for this split will be increasingly inaccurate, and will make it harder to put emerging audience behaviours in the correct context. Televisions are the boxes in the corner. They are still mainly used for watching broadcast content, but they’re also hooked up to games consoles, the internet, and other non-linear sources of content. We might own fewer TVs in our homes, but this is partly because we’re using other devices, like laptops, mobile and tablets, to replace the secondary Televisions we used to have around the home. The market for selling TVs is starting to flatten out after years of growth as customers switched to large flat panel digital TVs. With the ongoing financial situation looking bleak, and 3D not driving sales as much as predicted, its likely that UK TV sales will continue to plateau. Video is the content itself – the audiovisual content that we consume on an ever-increasing number of different devices. The combination of broadband adoption and smartphone/tablet sales has hugely increased the consumption of Video on devices that aren’t traditional TVs – for example, 23% of iPlayer content is delivered to mobile phones or tablets. Online video is probably the fastest growing media sector at the moment, and this is driven by social circulation and other emerging behaviours, not traditional distribution. For example, AdAge reports that 85% of the audience for M&Ms’ 2012 Superbowl ad was driven by social circulation, not traditional paid media. If you’re a production company making video things are looking pretty rosy – there’s never been more people looking to invest in making video – eg Youtube or Netflix – or more places to put video so it can be found and shared by audiences. This is only likely to increase in the next few years. Broadcast is the traditional business model for delivering video content to TVs in people’s homes. It relies on huge investment in distribution technologies over digital transmitters, cable or satellite, requires regulatory approval, and involves commissioning or acquiring content to fill separately branded channels that usually run for 24 hours a day. Commercial broadcasters rely on selling advertisements inserted into broadcast content to fund their business models. Broadcast TV’s share of the total ad market has been broadly flat in the last few years, with fluctuations based on major events like the Olympics. Current predictions are for a small contraction in the market in the UK after a modest growth in 2012. The trend for individual channel share has been downwards, as overall viewing has split across channels as UK audiences switched to digital TVs with many more channels available. Most broadcasters have managed this transition through launching portfolios of channels to keep their overall share up despite this fragmentation. Channel 4, for example, has seen its overall share go up from 10.3% to 11.2%, whilst the BBC and ITV portfolios have seen a reduction in share. This increased portfolio brings with it increased costs, as each new channel in the portfolio means more marketing and commissioning expenditure. New players like Lovefilm, Netflix and more recently Tesco’s Clubcard TV offer archive content from broadcasters and film producers on demand without having the regulatory or scheduling requirements of traditional Broadcasters. As a result, outlooks for growth for traditional broadcasters is mixed. Increasing ad sales inventory usually means launching new channels, which adds huge ongoing costs, whilst overall ad prices are being squeezed as media buyers shift investment to digital and other platforms. Only broadcasters with a direct transactional relationship with the customer – such as subscription channels like Sky or HBO – have some insurance against the flattening digital ad sales market. Put simply, if you’re reliant on traditional display advertising around free to air linear channels for your broadcasting business model, you’re looking at flat growth in the next few years, and possibly decline. So – TV is the box in the corner, Video is the medium, and Broadcast is the business model. When we talk about the state of our industries, and their potential futures, lets be more specific in our language. If you’re talking about broadcast media (as Thinkbox and BARB do – their stats only refer to content produced by the major broadcasters, not Youtube, Netflix or other VOD providers) then use the definition ‘Broadcast TV’, not just ‘TV’. The thing that we’re all watching more of is Video – online, on TVs over broadcast channels, on our phones and tablets, on Xbox’s, or whatever. TV is increasingly too small a definition, with too much historical baggage, to capture the way video consumption is growing. I don’t travel abroad for work a lot, but when I do, it tends to be for a fair bit of time – at the moment, I’m away for a fortnight in New York. 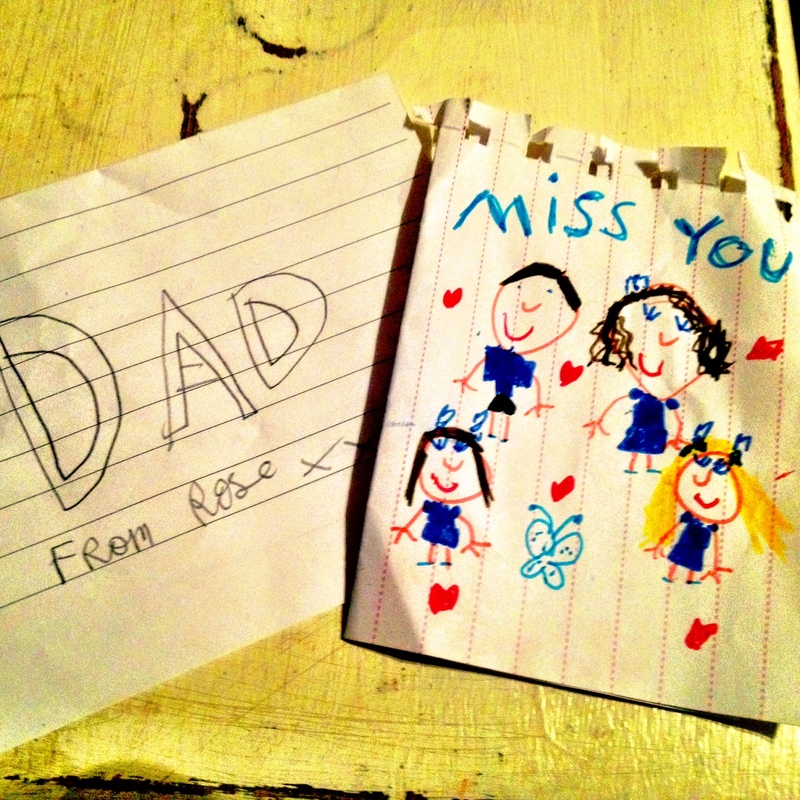 One of the hardest things about travelling is missing your family, especially when you have young children. Over the last few years, though, there’s been more and more lovely little bits of technology that make that gap shrink just a little, and make being so far away a bit less painful. Mobile phones were the first, of course, and tech companies have long spun utopian visions of how mobile tech connects us seamlessly and perfectly, as if we were in the same room again. The reality is less impressive, especially with roaming call and data charges making it incredibly expensive to do anything more than have a quick chat. Skype, Facetime and Google Hangouts are awesome, coming closest to the tech companies idea of perfect telepresence. But its the playfulness that makes the tech really work – my 8 yr old daughter spinning around with the iphone so the facetime call takes on the look of an 80s rave video, or my 6 yr old holding her school homework right up to the webcam so I can see her drawings. But the things that really seem magic are physical. The photo above is the two notes that my daughters slipped in my luggage before I left. I’ve been responding by sending them messages daily via BERG’s Little Printer, and their excitement at seeing the message print out, as if by magic, as we chat on Skype is a delight to watch. We’ve been playing with what to send – I started with just saying hello!, and then sending a good night message before they went to sleep. Then I started sending jokes – first the set up line, and then after they’d read it, the punchline. Little Printer is perfect for short, serial messages like this, so I might play with it further, and tell them a story about New York, a few messages a day. We don’t have teleportation yet, but these little physical messages feel like a step on from the glass screens we’ve been using to talk to each other for the last 10 years or so. They are bits of me they can keep, pinned up on the wall or kept on the bedside table, like the short notes they slipped into my luggage. It feels like teleportation, to be able to make something print out in Hove from my computer in NY, to make a message typed out on my screen manifest itself as a physical object many thousands of miles away. We’re gradually getting there – first we could send voice across the miles, then SMS texts, then MMS photos, then live Video, and now, actual things. We’re not in the seamless perfect future of the tech companies visions, but the patchwork telepresence we have from all this little bits of tech is much more emotionally satisfying. UPDATE: Jack Knight has written a fantastic comment on this post, giving a lot more background to BARB and sampled ratings in general. I highly recommend reading the comments after the post. If you’re interested in the history of audience ratings, I highly recommend reading ‘Rating The Audience: The Business of Media’. How can mistakes like this happen in a multi-billion pound industry reliant on accurate audience metrics? Looking for an answer to that question opens up lots more questions about why such a huge and influential industry relies on relatively crude measuring techniques that haven’t changed much in decades. TV ratings are measured using mechanical devices that record the presence of viewers in the room when the TV is on, usually by the viewers pressing a button to register that they’ve entered the room. So it really registers presence, rather than attention – the viewer could be reading a newspaper, doing the ironing or using their iphone, but for the sake of the ratings they count as an avid viewer. Ratings technologies have been refined over time, but the basic concept hasn’t changed since it was invented by Arthur C Nielsen to measure radio audiences in the 1930s. BARB is the UK version of TV ratings, using a panel of 5,100 homes to represent the UK TV viewing public. So each percentage point in the examples above stand for a measurement sample of just 51 homes. The amount of people in these homes is around 11,300, so each percentage point stands for a maximum of 113 people pressing their buttons when they walk into the living room. It’s often a lot less, as the percentages above are share of the total viewing audience (BARB calls this the ‘universe’) at that time – many BARB panellists might be out of their homes, or might not have the TV on at that time. If we take the numbers of viewers in the sample above, we can work out the size of the TV viewing universe watching when these errors occured. For example, the 8.9m audience originally reported for X Factor was 33.6% of total viewers that night, so one percentage of that audience is 8.9m/33.6% – 264,880 viewers. This means that the BARB’s estimate for the total UK TV viewing audience on a Saturday night is around 26.4m people, which is 39% of the UK population of 62m people. So we could transfer this to roughly work out that the number of BARB Panellists registering themselves as viewers that night is 39% of 11,300 – 4,407 people. Still with me? Lets now take the share of X Factor’s reported viewing to work out how many BARB panellists registered themselves as watching that programme. The original share reported was 33.6% of total viewers. We know the total BARB panellists watching TV was 4,407, so the number watching X Factor according to the original report was 33.6% of 4,407 – 1,481 people. So BARB measures 1,481 people watching a TV programme, and extrapolates that number to report an audience rating of 8.96m viewers. No matter how scientific and representational the survey, is remarkable to think that multi-billion pound creative decisions are made on such a small sample size. Now lets look at the error size. BARB under-represented X Factor’s ratings by 3.31 percentage points, which was a difference of 880,000 viewers in the reported ratings. Again, if we take the total panellists viewing X Factor that night as 1,481 people, 3.31% is 49 people. An error in measuring 49 people pressing a button when they walk into a room means that one of the UK’s largest media businesses under-represented the performance of their most important programme by 880,000 viewers. Is it just me, or is that completely insane?